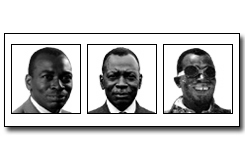 This site (which is currently under construction) will eventually present a complete biography of the Ugandan statesman, mountaineer, educator and writer, Timothy Byabasakuzi Bazarrabusa. It will take advantage of the Web's unique features as a publishing platform to provide a hypertext narrative enriched with dynamic timelines, a comprehensive bibliography, a glossary, and a variety of primary sources (images, audio, transcribed Legislative Council speeches, bilingual literary texts, etc.). For a slightly more detailed overview of the project, please see the related research blog.